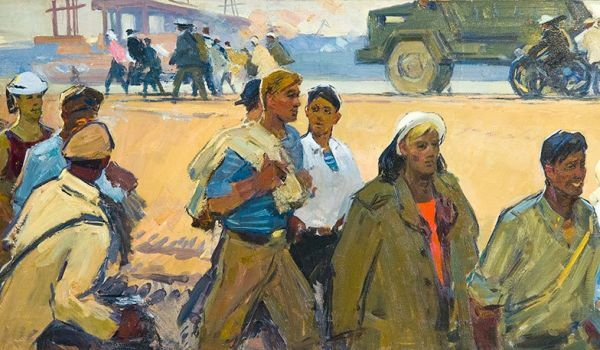 Buy works – Homenko Boris Ivanovich | (1930-2014). Painter. Member of the USSR Union of Artists. In 1960 he graduated from the Institute. I. Repin (workshop of VM Oreshnikov). In the museum-diorama is stored a collection of drawings made by him during his youth in the besieged Leningrad, incl. sketches from life. Participant in 8 personal and more than 160 group exhibitions, mainly in Russia and in France, as well as in Austria, Belgium, Bulgaria, Great Britain, Hungary, Israel, Ireland, China, USA, Turkey and Japan. Year: The end of the 1950s - the beginning of the 1960s. Construction of the Bratsk Hydroelectric Power Station. Year: The end 1950s- The beginning of 1960s.